Happy Monday everyone. I hope this finds you all well. I’ve had a busy week and busier times to come. Last week started with a lovely trip into town with Jane, a glass-maker friend of mine. When we meet up, we treat the occasion like a ‘bunking off school’ kind of day and take in as much art and culture (and good food) as our day allows ! 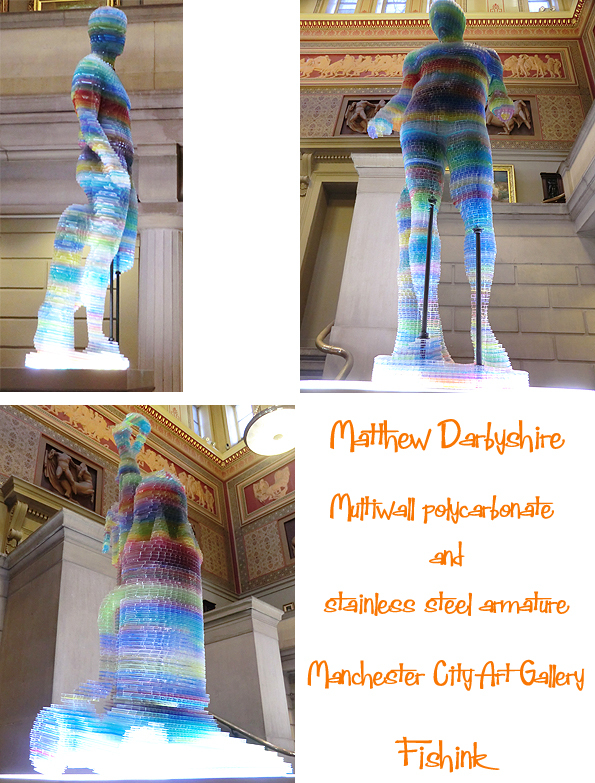 We came across Matthew Darbyshire’s work in the City Art Gallery. He seems to strip away the symbolic power of the classical and everyday object through his combination of experimental processes and traditional methods. Eye catching ! 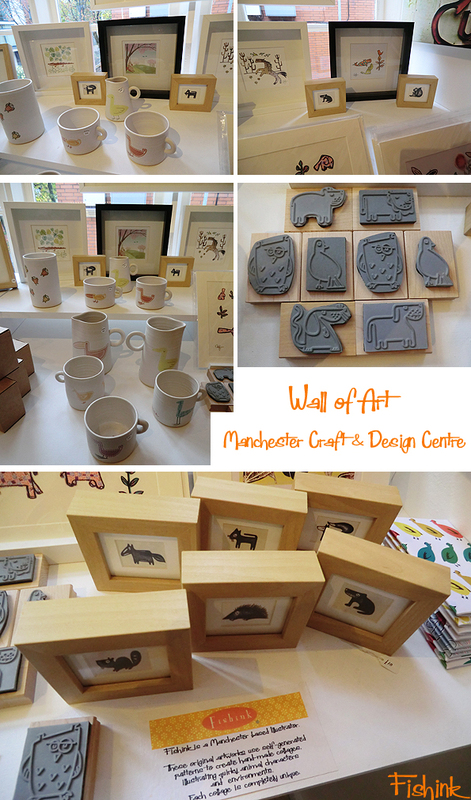 I popped into Wall of Art on the top floor of the Manchester Craft and Design Centre on Oak Street in the Northern Quarter, to see how my artwork was selling before re-stocking for the Christmas rush (hopefully lol). The display looked great. Don’t forget if you want something Fishink-wise for Christmas then just pop in the shop or visit the website. This weekend we’ve been looking after a dog-walking-friend’s-dog, Monty who is a very well behaved, but very active, black cocker spaniel. 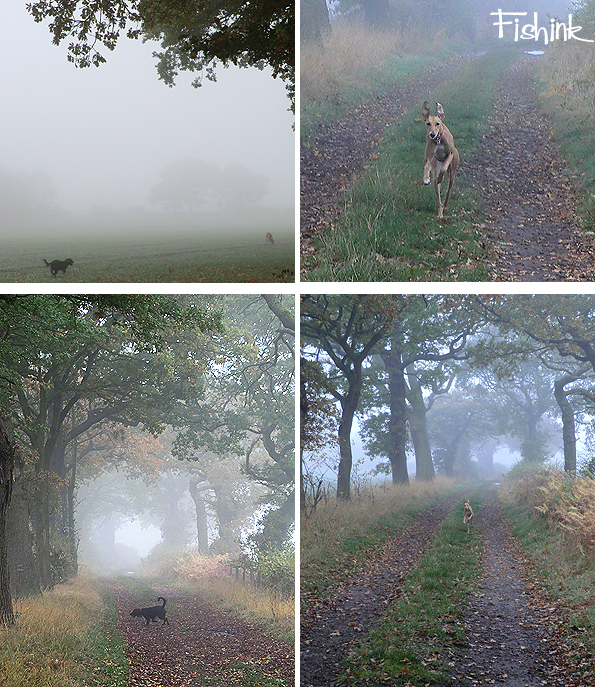 The weather on Sunday had promised to be very warm and quite unusual for November, alas it didn’t happen and instead we were faced with misty, cool temperatures, which admittedly added another dimension to our walks. Monty and our dog Boo get along very well and are both renowned squirrel chasers. 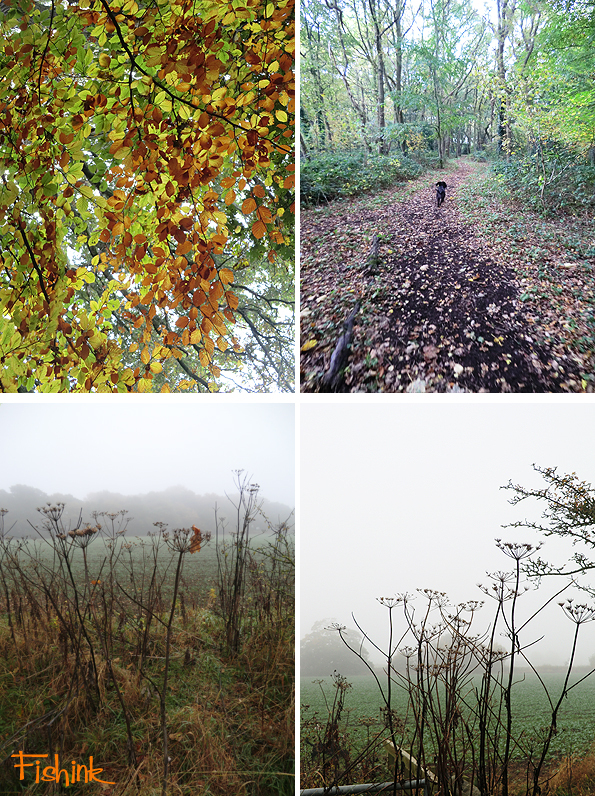 Whilst Boo leaps through the woods in bounds and gazelle like leaps, Monty quickly speeds through the undergrowth (gathering half of it with him in his coat) before stopping at a tree and barking frantically where the squirrel has previously leapt heavenwards up the tree. They make a fine team. It’s actually Boo’s birthday today, she’s just turned two ! 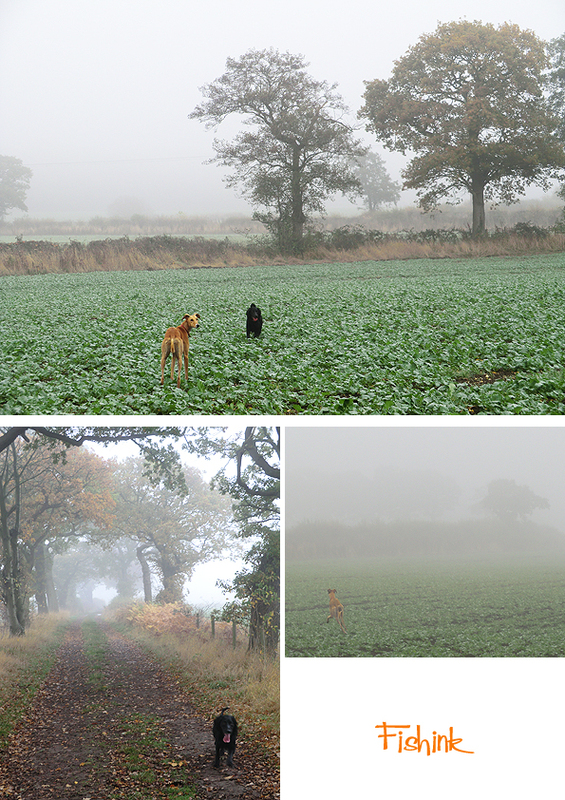 I love these misty lane shots taken near to the Arley Hall Estate. I have also realised that in the five happy years of compiling Fishink Blog, I’ve now reached a point in my life where other interests are strongly competing with the time I have available for writing the three posts a week. I totally understand you needing more time, and therefore having to blog less – am just happy to know that you will continue doing it once a week……. and a huge thank you for all the wonderful artworks you have brought us. We had a great day in Manchester! Thanks for showing me round. Your work looked really good in the Craft and Design Centre, Im sure you’ll sell loads for Christmas. Only 1 fishink blog a week??!! We understand and will look forward to it as much as ever. Thanks Jane… for your understanding and for being my truanting partner in crime ! Great to see you too. Aww thanks Elaine, great to hear you’re enjoying the posts too. I’ve 6 to go before the 1000th but yes that goal is in sight lol Thanks for the encouragement and comments over the years too. That’s often (as you know) what gets you through the quieter times. ‘bunking off school’? Must be like our ‘skipping school’ which I relished doing when I was in high school. And interesting enough, my friends and I headed to the art museum… great days! I’ll still be tuning in for your once a week post and if by chance… you stopped altogether, remember I have that folder on my computer of all your posts! Great photos.
. Have a nice evening 😊! Good for you, and once a week, how perfect in fact, just enough to be the treat we are waiting for… and leaving us with ideas and lots of visual energy to create or enjoy. Lovely photos…. Monty came home a very happy dog! Checked out your link to Arley Hall Estate. Have you visited there? Beautiful gardens; there really is something beautiful to see all year round. Congratulations on your 1000th blog! I have thoroughly enjoyed them all and have found them really inspiring. I look forward to your blog always, it feels a bit like having a friendly art college tutor drawing our attention to all these great artists! It’s a great creative ‘library’. Thank you Fishink!